A little more than fourteen years ago . . . I can’t remember how precisely it started. I remember that it wasn’t my kind of game, or so I thought. My bread and butter at the time was the more old fashioned class of console RPGs, which involved menus and turn-based combat. My first legitimate action-adventure game was probably The Legend of Zelda: Ocarina of Time, and the transition into a 3D real-time environment was not smooth for me. I didn’t think I was good at the fast-paced action. It felt awkward and clunky to me, and I wasn’t sure I was ever going to like it. I was going to have to get over that though, because at the time, that looked to be the way video games were headed, and my sister was (and is) a die-hard Zelda fan. I was in charge of playing the game, she was in charge of navigation, so it was clear I was going to have to get with the program. So fourteen years ago, when my then-roommate Josh suggested we try a new PlayStation 2 game called Monster Hunter, I was dubious, to say the least. But he was really excited and I wanted to have a game I could play with my friends, so I said I’d give it a try. Well, I probably never got fantastically good at action RPGs, which is what the Monster Hunter series calls itself. But I didn’t really care, because it was awesome. In September 2004 Monster Hunter came out in the States, and I was quickly and unexpectedly in love with it. How could this be? The game is about . . . hunting monsters. The first game honestly didn’t have much story, so I thought it wouldn’t hold my interest. I live for story. The game also had little interest for me single-player, mostly because the learning curve was steep (objectively, not just because I was a n00b). So what about this game captivated a gamer who preferred story-driven, single-player games with lots of level grinding and loot gathering? 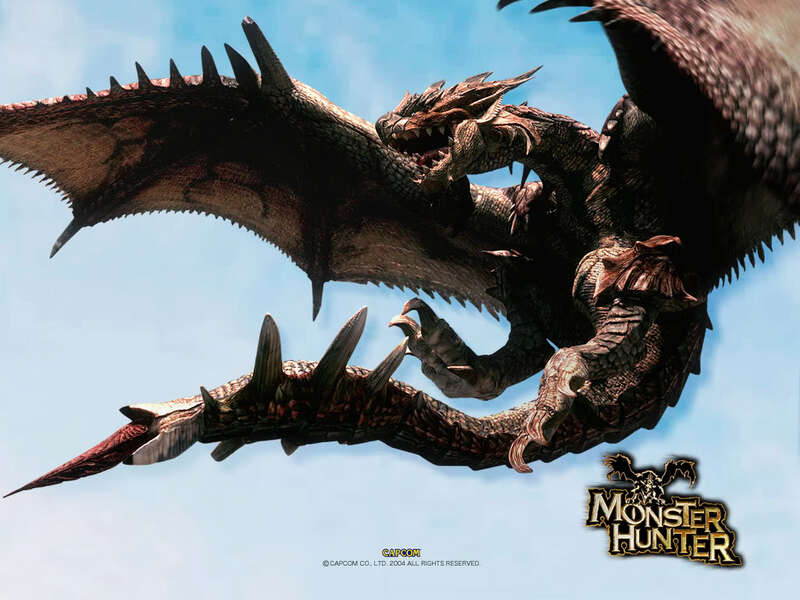 Hunting the monsters in Monster Hunter was hard in a fun way, a way that required strategy and teamwork. You couldn’t just grind levels until you could casually smash your quarry into pulp. As a matter of fact, there were no levels. You hunted monsters and gathered resources to make better armor and weapons and tools. Other than those upgrades you earned (and trust me, the MH series has no shortage of grinding for loot), it was all skill. And this turned out to be immensely satisfying for me, especially when I was rolling with my crew. It turned out I loved cooperative gameplay. My team and I carefully coordinated and picked out our weapons, armor, and tools based on our quarry, and then worked together to track it and take it down. What did this look like? Let’s say you were setting out to bag a Rathalos, the iconic MH prey. Rathalos is a large brown wyvern with a long spiky tail, poisoned talons and barbs, and fire breath. He is not to be taken lightly. How do you prepare? First of all, “better” armor in MH was not just about a larger defense stat; it wasn’t just higher number equals superior armor. You quickly learned that Rathalos was going to be hitting you with a lot of fire and poison, so you’d be well served to wear armor resistant or immune to that. Second, while in later games he was weak to Ice, Water, Dragon, and Thunder elements, in the first game, you were probably best served trying to paralyze or poison it, so you would bring weapons (or bullets for your Bowgun) that could do that. Also, it was wise to diversify the types of weapons your party brought. For example, the Great Sword had a powerful upward cleave move . . . that would also send a party member flying through the air if you hit them with it. It wouldn’t damage them, but let me tell you, four hunters with Great Swords did not for an efficient hunt make. Then there were the utility items. If Rathalos flew away from you into another area, you could lose track of it, so it was best to bring Paintballs or Paint Shot to mark it so you could see it on the map. You could blind it temporarily with a Flash Bomb, which made Rathalos unable to fly until the effect wore off, enabling your party to whack on him some more. It might be a good idea to bring Pitfall or Shock Traps to immobilize him for a while too. You needed Whetstones to keep your weapon sharp so it would do more damage (or lots of bullets for your Bowgun), some Well-Done Steak to keep your stamina up, Potions to keep your health high . . .
See? This game was not child’s play. But oh, the feeling of working with your team to get that Rathalos, the joy of victory and the satisfaction of knowing you’d be using every piece of plate or claw or scale or shell or wing you carved off of that thing to craft armor and weapons that would make you and your team more versatile and formidable . . . I love working for my team! Which you should know, if you’ve been reading my articles, since I’m a career support player. I also love to play smart, and the Monster Hunter series is wonderful to play if that’s your play style. You have so many resources to disable and debuff your quarry: traps, bombs, ammo, elemental weapon attributes, and more. You have access to buffs and heals for your party too; there are flutes that make you hit harder or have more defense, for example, and there is ammunition that actually heals party members if you shoot them with it! These games are not just about button-mashing or having high stats. You have to think, learn, prepare, and react. As a matter of fact, sometimes it’s best not to bring the biggest weapon. My preferred weapon in MH is the SnS, the sword and board, or simply, the Sword and Shield. One of the smaller weapons, for sure. But don’t count it out even though other weapons hit harder. First of all, you can shield bash in the later games, which has a chance of stunning your prey. In some of the games you could take a potion or drinkable item while guarding and without putting your weapon away, a huge advantage! It has a fast recovery time, so you can chain attacks much easier than with a bigger weapon; it may not hit as hard, but if you’re good, you can hit often. And finally and most importantly (in my opinion), the Sword and Shield typically has high elemental damage and a high chance to inflict status ailments like poison, sleep, or paralyze. Josh, who was playing upstairs in his room, chose that moment to type, “It’ll be fine. Let’s go.” My sister lapsed into sulky silence, comforted by his affirmation of my choice in black and white on the screen, but grumbled when the other player replied, “OK, but we’ll have to start again,” implying that we couldn’t win unless I brought a more acceptable weapon. When we found the Rathalos shortly thereafter, I leapt into the fray like an avenging Valkyrie. I’d take credit for being graceful, but really, Sword and Shield is good for that. Within five quick swipes, the Rathalos howled and crumpled, tangled by the frenetic yellow lines that implied he was paralyzed. I got lucky, it normally takes a little longer than that. Even so . . .
“Yeah!” Josh yelled from upstairs, making us laugh, which was followed shortly thereafter with a “Good job!” in the text box on the screen from him, obviously for the naysayer to see. The naysayer said not a word for the rest of the successful fight, and the Rathalos was paralyzed two more times before it went down, which was an unusually high success rate. The gaming gods were with me that day, it seemed. Monster Hunter was great for memorable stories like that, every hunt was a little different, and winning always felt satisfying. The online servers for the first Monster Hunter game have long been shut down, but while they were active, they also had events, where you could earn special items and weapons, and sometimes fight special monsters. My favorite was the Kirin. He wasn’t large, certainly not in comparison to most of the other monsters. No, he was small and quick and could turn on a dime, a beautiful, terrifying, blindingly-white unicorn with shimmering scales, piercing crimson eyes, and a white beard, sizzling with lightning that he was all too happy to try and kill you with. Kirin does not exist in the single player game . . . and therefore, he no longer exists in the first Monster Hunter. Oh, Kirin, my muse! How I’ve longed for you all these years! I hunted him to make my glorious Kirin Bolt, the sword made from his purple horn and a shield with spikes splayed like sunbeams. I remember distinctly wishing for Kirin armor, and wondered what it would look like. Why couldn’t I have Kirin armor? It turned out there were two reasons. One, I lived in the land of heathens who didn’t appreciate the glory of Monster Hunter, AKA the US. Two, I was a console/PC gamer, and almost never owned a portable gaming system. Under these restrictions, I have only played Monster Hunter, which came out for the PS2 in 2004, Monster Hunter Tri, which came out for the Wii in April 2010, and Monster Hunter 3 Ultimate, which came out for the Wii U in March 2013. MH3U, by the way, was just MH Tri with a few additions, namely, underwater fighting (and therefore a few underwater monsters), and G rank, a level above high rank that had a new set of quests, harder monsters, and improved weapons and armor. I bought my Wii and Wii U specifically to play these games, and only have a couple of other games for each system. I am a devoted Monster Hunter fan. Anyway, Kirin armor was available on a few of the portable titles that made their way stateside, but not in MH Tri or MH3U. You couldn’t even fight the Kirin in those games. I have never had the opportunity to have Kirin armor. Well, in a few more days. The long-awaited Monster Hunter: World, which released on the PS4 and XBox One internationally in January 2018, is coming out on PC on August 9th! Six days away! I can hardly contain my excitement. If you’ve been reading my articles, you know I’m also a Final Fantasy XIV player. Therefore, I knew there was going to be a crossover event in FF XIV that starts on August 7th, where you can fight Rathalos, get sweet-looking Rathalos armor, get a Rathalos mount (I’m going to fly that thing everywhere! ), acquire a couple of minions, and earn an MH-style BBQ spit for your yard (I hope it plays the song!). I just found out today that MH: World is having a crossover event too! By the time you get to read this, you can fight a Final Fantasy-style Behemoth! You can also get Dragoon armor, get equipment for your Palico that will make him look like a Moogle (I’m never taking that off once I get it), and encounter Cactuars in the field that can apparently be utilized as environmental traps! I’m in serious trouble. I have a life to live that can’t be totally consumed by Final Fantasy and MH. I’ve got a husband, friends, obligations. I’m potty training a two-year old. I hope these crossover events last a while, is all I’m saying. I can’t afford to not sleep.